Thozilveedhi is one of the most popular employment newspaper read by millions of job seekers. The 29th November 2014 issue of this news weekly comes with rising job prospects in both government and private sectors. The new edition of Thozhilveedhi is thickly packed with jobs in SBI Banks, SBT, CRPF, CISF, United India Insurance, Pollution Control Board, KUFOS, IIMK, KINFRA, ASAP, NUALS, CWRDM, CUSAT, Hindustan News Print, Cochin Shipyard and IOCL. Fresh appointments in Sree Chitra, NIT, IHRD and Calicut University and various Universities including Kerala and Calicut are also reported. While going through the pages, readers can find latest job opening like 6435 opening in SBI Banks, 1300 in SBT, 791 Constables in CRPF, 176 in CISF, Specialist Officers in 21 Banks, 684 Assistants in United India Insurance, 56 in Pollution Control Board, 3 in KUFOS, 1 in IIMK, jobs in KINFRA, 6 in ASAP, 2 in NUALS, vacancies in CWRDM, CUSAT, 14 in Hindustan News Print, 4 Cochin Shipyard and 100 Junior Research Assistants in IOCL. LGS rank file prepared by Lakhsya Academy, CDS, IBPS PO exam orientation by TIME, LP/HSA,DEd & Pre Primary Nursery Teacher exam guidance provided by Florence Academy would enlighten the candidates who are currently undergoing final preparations. In the PSC special section, news about PSC Interviews in December and time taking for the Fireman Rank List are given with prominence. 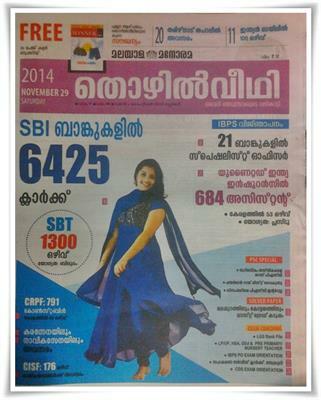 Solved Last Grade papers of Malappuram and Kottayam districts are published in this issue. Exam coaching of Cooperative Service Clerk, Secretary will guide the job aspirants. Regular columns like Open Forum, PSC for Beginners, Syllabus of various upcoming Kerala PSC exams and Hall Ticket details will be much beneficial for the PSC aspirants. Questions put forward by the readers are answered by PSC officers. 'Competitive Winner', the free booklet provides the most recent General Knowledge in capsule format is much informative. During the past, 'Thozhilveedhi' has proved to be the foundation block for those who are aspiring for a good profession.